It’s that time of the year when one gets a tan, take a much-needed vacation and grab a #LondonStyle Frostino at Costa Coffee! 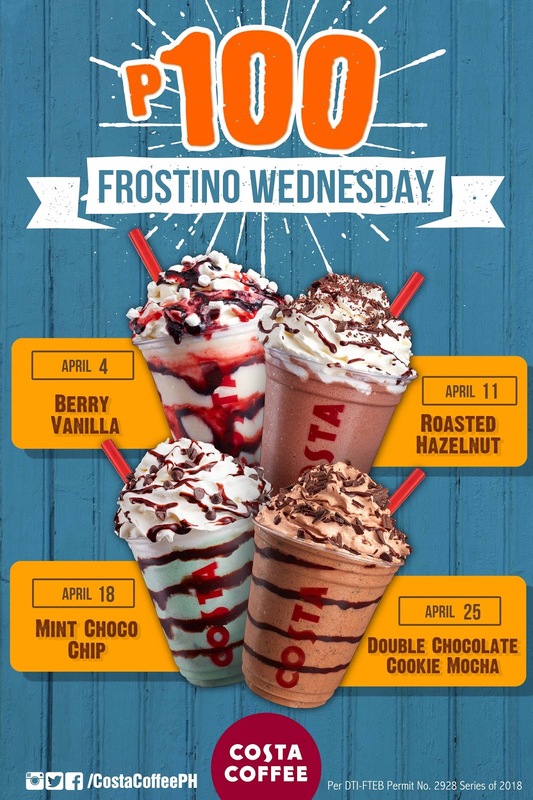 Take note of these dates when your favorite Frostinos will be offered at Php100. Mint Choco Chip Frostino is what you’ll get on April 18. This is another favorite, with that classic combination of fresh mint with dark chocolate chip, finished with whipped cream and chocolate drizzle. Costa Coffee branches are located at Robinsons Galleria; Robinsons Supermarket, Robinsons Galleria; Robinsons Place Manila; Robinsons Supermarket, Robinsons Place Manila; Robinsons Place Antipolo; Robinsons Magnolia; Robinsons Selections, Venice Grand Canal; Robinsons Equitable Tower; Robinsons Summit Center; Cyber Sigma, McKinley West; Robinsons Summit Center; Tera Tower, Bridgetown; Citywalk 1, Eastwood; UP Town Center; SM City Manila and The Block, SM North Edsa.